With the holiday season right around the corner, who doesn't need a new neck tie for their little man to help wow family and friends at your next gathering? I recently saw a picture (or at least I am pretty sure I did. I can't find it anywhere to save my life) of a cashmere necktie in an Anthropologie magazine and was smitten. But spending an arm and a leg for my four-year-old to look dapper wasn't going to happen this year (or probably ever). Fortunately, I remembered that I had scraps of a cashmere sweater laying around and decided at once to make my own version in a little boy's tie. I am so glad I did because he is incredibly charming in his knew neck tie. The tie is very easy to make and very affordable. First off, hit the nearest thrift store and buy a cashmere sweater (usually a couple bucks). Wash and dry your sweater so that it felts slightly so that it doesn't fray. Then cut your tie out. My scrap piece wasn't long enough so I had to make two pieces and sew them together in the middle. The entire length was about 28 inches long. Make ends come to a side point. Cut matching pieces of lightweight interfacing and iron on to the back. 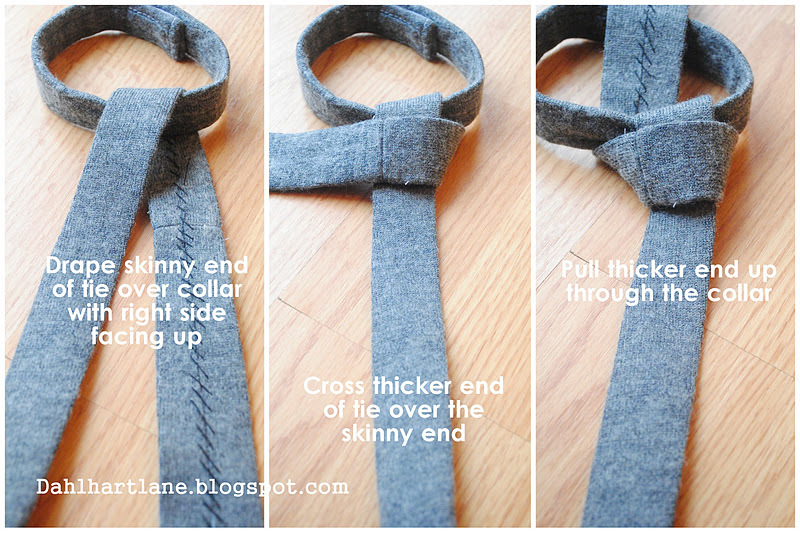 Sew flat ends together to make the body of your tie. Next, fold over the edge of the bottom of your point and iron flat. Fold end up, making a point. Iron flat. Repeat on skinny end of tie. Fold over sides of the body of the tie till they are touching in the middle. Iron flat again. Then stitch up the center. Set body of tie aside and cut out a strip of about 3 1/2x16. Cut matching piece of interface and iron on back. Fold in half with right-side facing in and sew up the long end. Turn right-side-out (with the help of a knitting needle or pencil and iron flat with the seam down the center. Fold in ends and sew shut. Sew on your fastener of choice. I am a velcro lover so that is what I used. It should look like this from the back. All done! Now your little man is set to impress! What I like most about making ties like this is that they are adjustable in every single way. When my son grows bigger, or if I want one of his younger brothers to wear it, all I have to do is untie the knot, reajust it, and tie it again. I hope you like it as much as I do! So cute! Is there anything you can't create?? You were featured! Happy Thanksgiving! Oh boy, another adorable creation! I agree with Aria, is there anything you can't do? Love it! 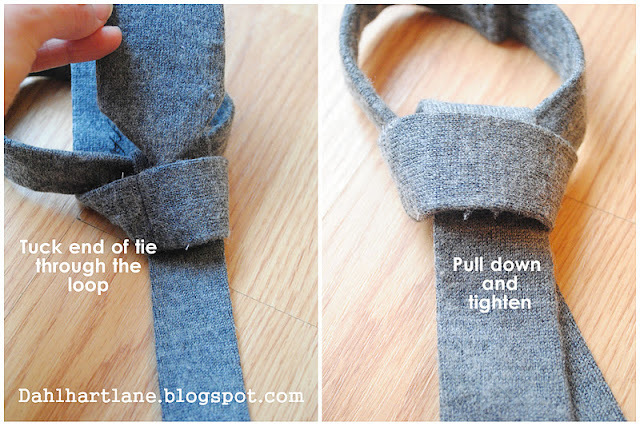 Thanks for sharing how to make a simple and budget-friendly neck tie for kids. Guess the same approach is applicable to making ties for adults too. 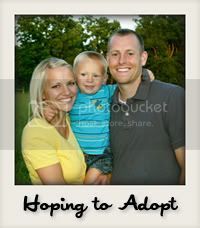 Help the Cotton family grow! All images, costumes, patterns and figurines are copyrighted by Malinda Jane Sieg, 2011. Simple theme. Powered by Blogger.